This lecture demonstrates how you can measure the width of an object (e.g. on a conveyor belt) in C# by using a USB camera. 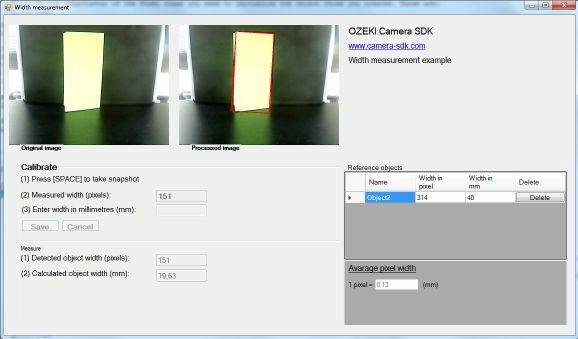 To implement this example, you need to have OZEKI Camera SDK installed, and a reference to OzekiSDK.dll and OzekiComputerVision.dll should be added to your Visual Studio project. To establish the connection properly between your application and a USB camera you should apply the same code snippet what you have used in the example (How to connect to an USB camera and display the picture in C#?). First, download the SDK and open the example in Visual Studio. Build your application and it will automatically connect to the default camera of your system. Then place the webcamera to somewhere (important: during the measurement do not change its distance from the objects you wish to measure). Take an object to a specific distance from the webcamera, and wait until the application will detect that object. Now, press Space button on your keyboard and provide the width of the object (repeat this step 2 or 3 times). Place an other object to the same place and the application will calculate the width of the object based on the width of the previous object. If the application detects the new object, you can see its size in the Calculated object width (mm) textbox. /// true if managed resources should be disposed; otherwise, false.